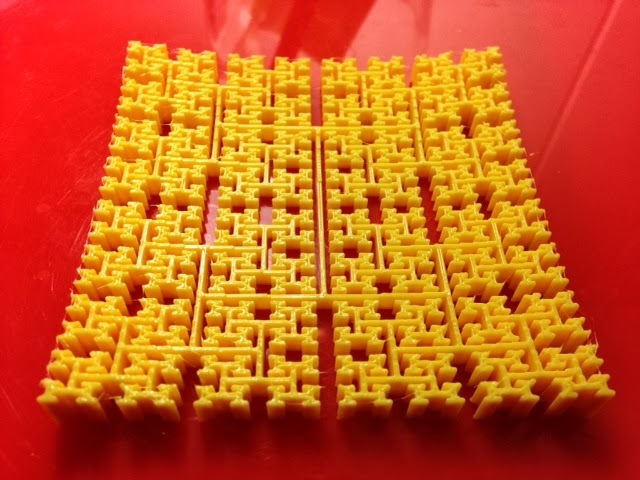 Here is a small dish whose pattern comes from a level 5 H-Tree, which is a fractal space-filling curve. It is designed so that a Replicator 2 on "low" will trace its path with one layer all over the curve. Settings: MakerWare "low", in an hour and 18 minutes. Technical notes: This model was made in Tinkercad with an imported .svn file. The original drawing of the H-Tree comes from a .jpg from a Princeton site and was converted to something Tinkercad can handle by using "Path/Convert Object to Path" and then "Path/Trace Bitmap", then saving as .svn. The bitmap technique does not seem to work for all images but it worked for this one; perhaps because the lines were a bit thick?